Plant growth promoting rhizosphere bacteria. 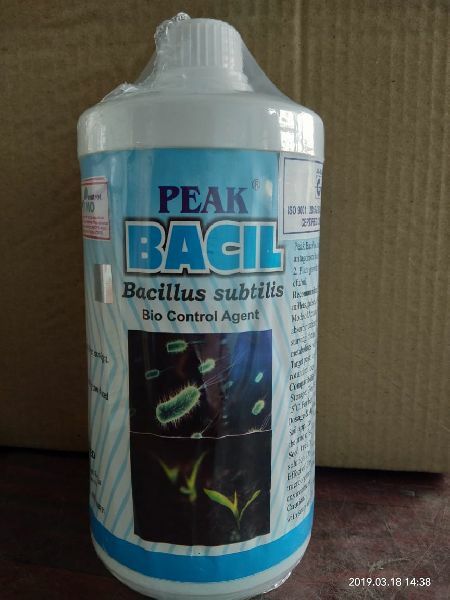 The Peak Bacil contain 1 x 10 cfu ml. Recommended for : Vegetable, fruits, spices, flowers, medicinal crops, cereals millets, pulses, oil seeds, fibre crops, orchids, ornamental plants. sugar canes. Mode of Action : Bacil's bacteria colonize maximum space of the not system and absorb nutrients available at the target site. Thus Bacil control the pathogens by starving them for food and space. Bacil secrete certain antagonistic secondary metabolites which have an antagonistic fungal effect. Target Pest : Control early blight, root rot, root wilt, seedling rot, late blight stem rot and mildew. Compatibility : Not compatible with chemical pesticides. Use once it opened. Storage : For long storage, store in cool & dry place at temperature below 10-15 C. For better result Bascil should be used within six months from the mfg. date. Soil Application : Mix 100mI bacil in 100 litres of water and spray onto the soil at the time of sowing/planting. Effect of Environment : This product is based on naturally occurring microorganisms and ubiquitous in nature. This product is sate for human and environment. Clean hand with soap alter use.